What? No tennis court in this new condo project...??! If you happen to have read our post on WATERFRONT KEY, you will remember the praise (probably the only) we had lavished on this project for having two tennis courts when even some of the comparatively higher-end developments have only one or none. The first paragraph of the report echoed pretty much the sentiments that the wife and I have about the new projects these days - Paying big money does not necessarily get you everything these days, at least when it comes to buying a private apartment – so aptly put by Ms Yap. New homes going for as much as $2600psf can offer designer furnishings and place you in a coveted district, but they may no longer come with large common spaces or even tennis courts traditionally associated with a private address. Ms Yap has listed Marina Bay Suites, Sophia Residence and Illuminaire on Devonshire as examples of projects in the core central region (CCR) whereby home seekers would not find tennis courts. And further from town, buyers have paid as much as $1345psf at Alexis or $1514psf at Suites @Guillemard, where there is just a margin of space around the buildings, and swimming pools and gyms congregate on the rooftop. So you do not have to go around searching for that tennis court at these developments ‘cos there is none. Many projects these days apparently cannot offer large landscaped grounds or a full range of facilities simply because their sites are not big enough. A tennis court alone measures 78ft x 36ft, taking up 2808sqft. While a developer could try to tuck a court just nicely into a smallish site, it could become a “disamenity” to residents living too close to the noise. In fact, there are buyers who do not expect to see tennis courts for smaller projects within or near town. Even if they really see one, they’ll be asking if it will be too near to their units – this, according to EL Development managing director Lim Yew Soon. EL Development has three projects in CCR which do not have tennis courts – Illuminaire on Devonshire, Parc Centennial and Rhapsody on Mount Elizabeth – but they are sold out. Many projects are still able to command high prices because of their location. This is especially so if owners intend to rent the apartments out. The absence of a tennis court, for instance, may mean a longer search for a tenant but rents are unlikely to be dented much. At the end of the day, “location is everything”. Guocoland is banking on Sophia Residence’s location near Dhoby Ghaut MRT station to attract buyers. The project does not have a tennis court, but home seekers’ main buying criterion, according to the developer, was to be in the city, to have easy MRT access to all parts of Singapore and also a property which offered attractive rental yield. Beyond site constraints, high land prices may be prompting developers to cut back on common spaces and certain facilities. But that’s not to say that all developers have free rein on the site design. The URA has rules on site coverage, which indicate how much space buildings can occupy. For developments classified as flats/apartments and condominiums, site coverage cannot exceed 40%. Still, developers are careful to keep features which residents cannot seem to do without, namely swimming pools and gyms. And only where possible, they will incorporate tennis courts. As it becomes harder to find prime projects offering large ground spaces and complete facilities, existing developments with these features (e.g. Ardmore Park) are likely to stand out. Call us old fogies if you like, but the wife and I can still remember a time not so long ago (i.e. 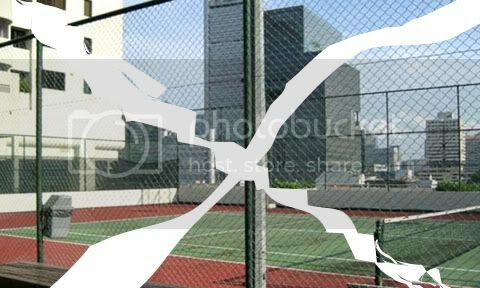 definitely after policemen have stopped wearing shorts) when you can expect certain facilities that will come “standard” with a private condo development – and tennis court is one such “standard” facility. The wife and I like to reiterate that neither of us are tennis enthusiasts. And other than the few BBQ parties/ Functions (less than 5) we hold within a year and our son’s occasional forays to the swimming pool, we normally do not use the facilities within our condo much. But as per any typical condo residents, we like to rest easy knowing that the “full facilities” are there and available should you wish to use them. But with new condo launches these days, you will often get marketing agent telling you…“Oh, this is a full facilities condo project – only the tennis court is not provided”. This is the reason why we felt that the older condos (e.g. Bayshore Park & Hillcrest Arcadia, off the top of our heads) actually provide you with more bang for your buck, as they belong to a generation of developments whereby the words “full facilities” carry far less ambiguity. And given that the current prices of older condos are still very much lagging the prices for new launches, this makes the former an even better proposition than the later – this is as usual, in our humble opinion (IOHO), of course. 1 comment to ''What? No tennis court in this new condo project...??!" Hope there are tennis court in there so that when you feel bored. Just go and play there.